"Well, there's not a day goes by when I don't get up and say thank you to somebody." I recently wrote about companies and organizations that honored teachers during Teacher Appreciation Week. Teachers absolutely deserve attention for their hard work, not just during one special week but throughout the year and in as many forms as possible. I’ve also written about telling custodians how much they are appreciated for without them, schools would be much less comfortable and conducive places for learning. There’s another group of people who work in schools who also merit thanks. Volunteers often do jobs no one has time for, wants to do, or can’t do because they are too busy trying to get other things done. Tasks such as photocopying and collating, duties such as supervising kids at lunchtime and recess, and supporting teachers in the classroom by making sure kids remain on task during center or station work. To a certain extent, in this age of having to do more with less, volunteers are the linchpins that keep schools running smoothly because their presence helps the staff do their jobs more effectively. I was fortunate enough to be a volunteer this past school year in a 7th-8th grade elective class about career and technical education. Most of the time, I supervised the kids who were cooking and made sure they followed the recipes and didn’t do silly things like throw sugar in a hot oven to see what would happen. (One student did that on a day I wasn’t there.) Other times, I gave presentations about being a Peace Corps Volunteer and teaching English in foreign countries, as part of the job exploration component of the course. Spending one period a week with the class let me stay up-to-date with middle school fads and foibles – yes, I got to see bottle flipping and fidget spinners first hand, though only bottle flipping was an issue in the class I was in. Volunteering also let me utilize my teaching skills, albeit not as much as I would’ve liked since it wasn’t a core academic class. But more importantly, having another body in the class – me – allowed the teacher to give help where it was needed while knowing that the other students weren’t being neglected. That gave her peace of mind and enabled her to be a better teacher. The school gave a lunch at the end of the year for all the volunteers to thank us for our work. 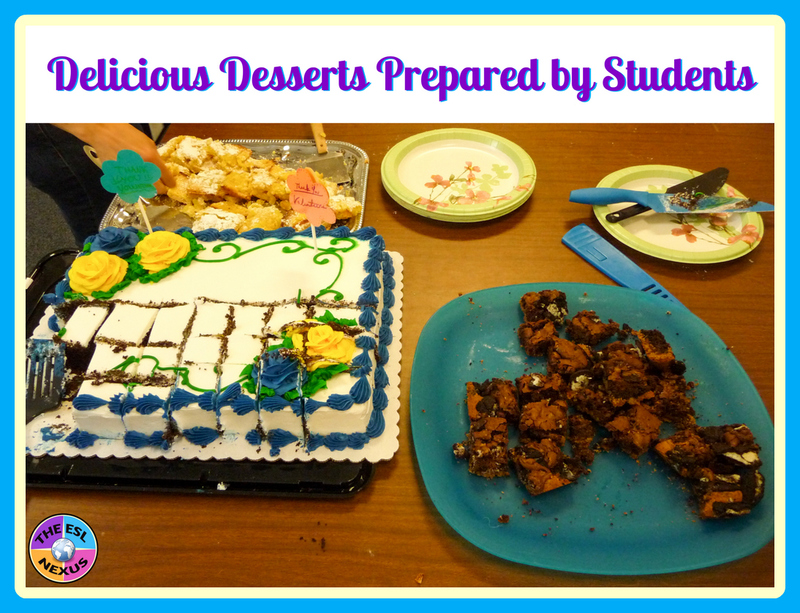 The students in “my” class baked brownies, which they made on one of the days I was helping out, and lemon bars for dessert; both were delicious. Hamburgers, salads, watermelon and a cake were provided by the school. The tables in the staff dining room were decorated and handwritten signs saying “thank you” were scattered throughout the room. It was a lovely gesture and I certainly appreciated it. 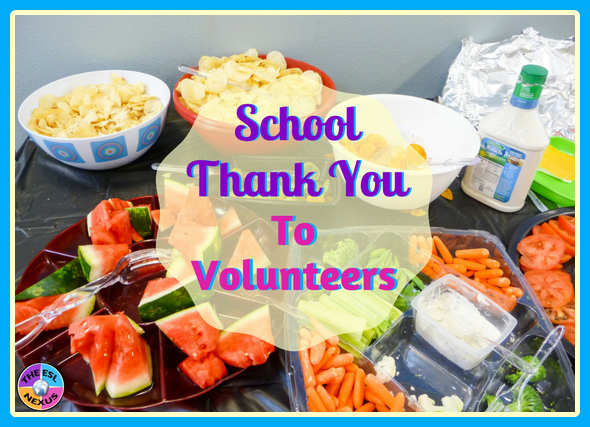 I don’t recall my school in Massachusetts doing anything on a school-wide basis to thank the volunteers there. I think it was left to the individual teachers to do something. But I never had a volunteer work in my class so I didn’t pay much attention. 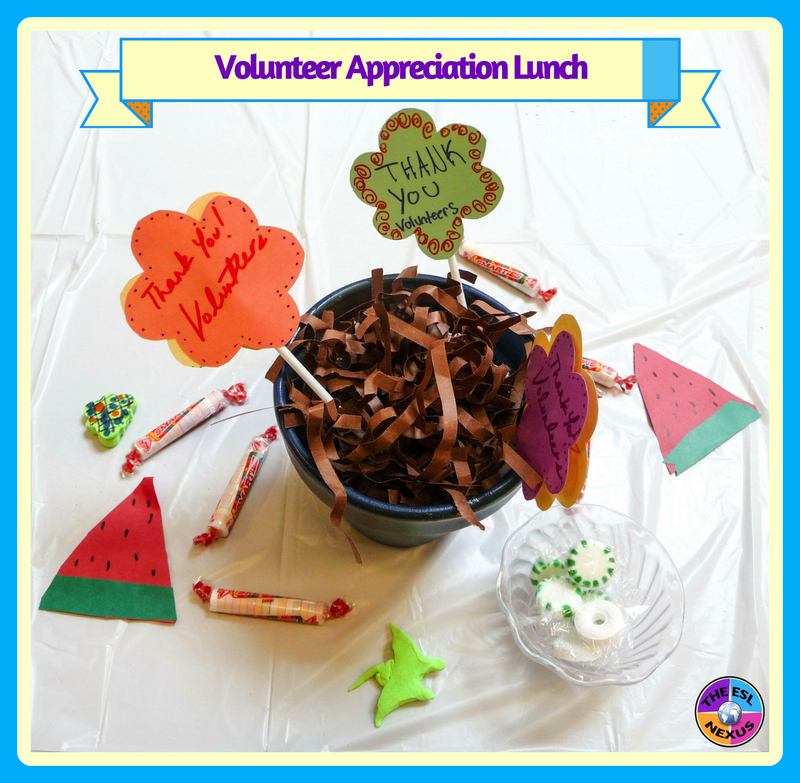 If you have a volunteer in your class, how do you express your thanks at the end of the school year?